February 21, 2012 Dan O.
Christy Brown makes seem like a real lazy dude. 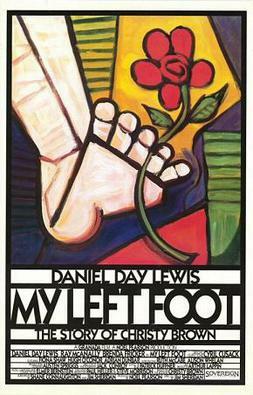 My Left Foot tells the true story of Irishman Christy Brown (Daniel Day-Lewis), who was born with cerebral palsy, only allowing him to only control only his left foot. 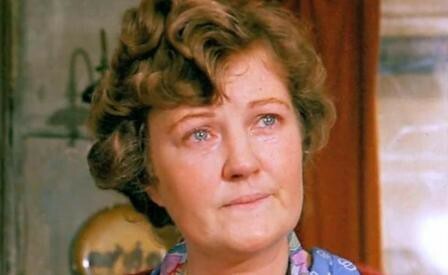 The film follows Christy Brown over time where he soon becomes a writer, artist and builds strong relationships with his mother (Brenda Fricker) and the rest of his working-class family. Director Jim Sheridan does something with this pretty generic story, and make it actually very interesting to watch as if we’ve never seen this type of plot ever done before. One of the main reasons being is the fact that it is not told like the regular Hollywood biopic where you get a whole bunch of cheesy montages, sentimental scenes, and moments that seem only made-for-film rather than sticking straight to the realistic approach. Sheridan is able to linger away from these conventions and I think that is why this film mainly works. Even though the film does try to set itself apart from what we usually see, the film still has great moments of inspiration mainly because this man, Christy Brown is such an extraordinary human-being, even if he was a little hard to handle. How a person can create beautiful paintings, write a whole book, and still be able to play soccer by only using only his left foot is really something remarkable especially since the doctors told his parents at birth that he would be nothing but a vegetable. The film not only shows him as an inspiration to everyone, but also a person that had many anger issues and was very smart even though he could be sometimes very hard to work with. Rarely will you ever really get a film, let alone biopic, that shows the person they are portraying in a relatively dark light. Christy Brown was a gifted human-being (although some may disagree) but he was also a person that did not appreciate a lot of the things and it’s not that it made him a bad person by any means, it’s just the fact that he was very hard to be friends with or even work with. However, the film did have its fair share of problems. I felt like the score that was played throughout the background the whole entire film, not only took away from a lot of the more emotional scenes but also were annoying because they didn’t really do anything for the scenes themselves. There are some great moments of silence but to be honest, I wish the whole film could have been played with silence considering it would have made the film seem a lot more realistic, which is obviously what the film was trying to go for. The last part also feels rushed and ends on a pretty weak note. There were a lot of aspects of Brown’s life that were sort of left out and other parts that were random. We randomly get short bits of Brown holding a paintbrush as well as typing away on his type-writer, but never anything else added on to those scenes. This may seem like a strange complaint but I just wish they at least took their time with showing Brown’s later-life, instead of just getting past all of this in a hurry so they could at least say that they tried to end the film on a solid and emotional note. 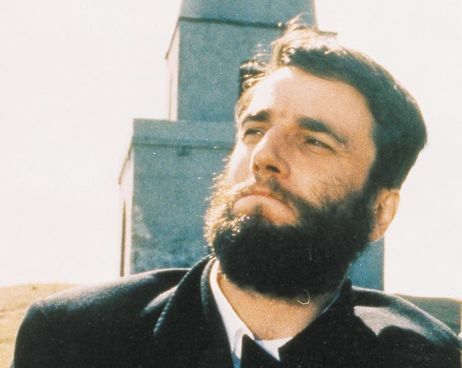 The real reason why this film works is because of the perfect performance from Daniel Day-Lewis as Christy Brown, who also won an Oscar for his performance. To say Day-Lewis is amazing, would be understatement, this is probably one of the best performances of a handicapped person in any film, and that is a long long list. Every chance he gets, Day-Lewis just brings out the raw emotion that seems to have always be built up in Christy Brown and takes what we usually see of mentally/physically handicapped person and make him seem more like a human-being that won’t stop doing whatever he wants to do against all odds. I honestly don’t think they could have gotten a better performance if they casted another person who actually had cerebral palsy. He is THAT good. Brenda Fricker is also great as his mom and gives her performance a lot of depth and warmth that all mommy roles should have no matter what. Did I keep on thinking about the pigeon lady from ‘Home Alone 2: Lost in New York’ whenever I saw her? Yes, but it still didn’t mean her performance didn’t deserve the statue that she got. Consensus: There were moments in this film that seemed a bit predictable, but thanks to Sheridan’s way of creating a realistic, precise, and inspirational story, mixed with the amazing performance from Day-Lewis, is what makes this film a must-see. In other words: I liked it. I agree that Daniel Day-Lewis was truly amazing in this role! Nice review. He totally was. Thanks Laura! Indeed it’s all about DDL’s performance (Oscar-winning). Definitely is all about his work here and it works in every single way. Thanks my man! This is a great film. I saw it when it first came to video and I had never heard of Daniel Day-Lewis. I honestly wondered if the actor playing the main role really did have cerebral palsy. (This was before the World Wide Web, let alone IMDB, so you couldn’t just go look people up.) When I watched the Oscars that year and finally saw him as he normally is it was quite an adjustment my brain had to make. I just saw Brenda Fricker in Albert Nobbs in a “blink and you’ll miss her” kind of scene. Not mentioned, but just as deserving of attention in my opinon is Hugh O’Conor, who played the younger version of Christy. The “Mother” scene was very emotional and O’Conor just sold it. I can’t believe I forgot to mention him but he’s also good here as well but then again, the whole cast is just as good as Daniel Day. Thanks Chip! but,im still confuse,why did Brenda Fricker never look old in all age of Christy?